Check out this wedding from September 4, 2011! 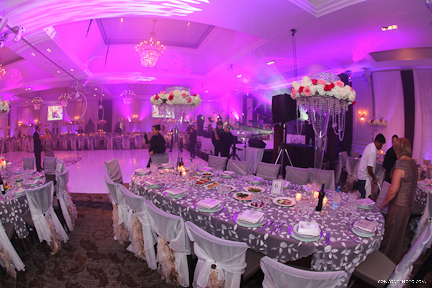 The ceremony and reception were held at Hazleton Manor Banquet Hall in Vaughan, Ontario. 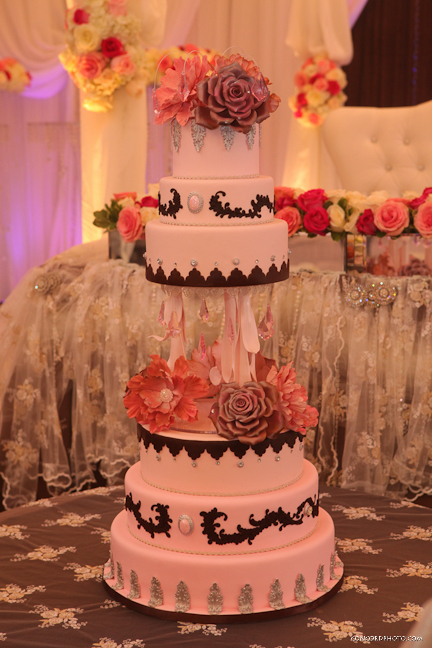 The bride wanted everything very classy and chic with an element of bling to glamourize the day. 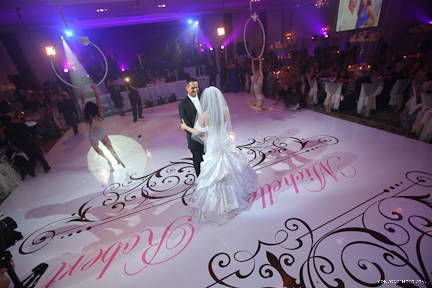 The wedding monogram was used in almost every aspect of this wedding including the dance floor, ice sculptures, programs, napkins and of course the menu. 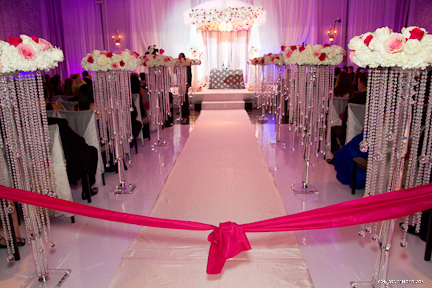 The ceremony space was lit with magenta uplighting to really bring a warm romantic ambiance to the room. Scroll programs were placed on every chair for guests to follow the ceremony. Once the ceremony was complete, the guests were wowed by the ice sculptures including a marinti luge, ice bar and vodka bar station. Designing Trendz blew the guests away with their stunning floral decor while Have a Seat did all the linen and draping work. Guests had the ability to sit in the lounge area during cocktail hour, where a2d2 aerialists were entertaining guests. The reception was no disappointment either. Guests entered a fully draped room with aerialists hanging from the ceiling. Plexiglass menus were places on every plate. The band really got the party started and didn't let up until 2am! Guests were provided with flip flops mid evening to ensure that they could dance the night away comfortably. Thank you to all the vendors who made this night possible!! !